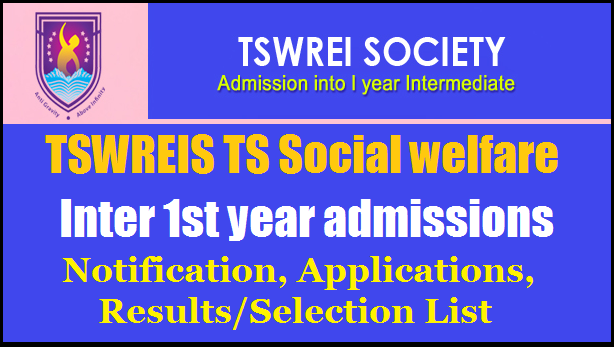 Telangana Social Welfare Residential Educational Institutions Society (TSWREIS) Hyderabad, invites applications from the Boys and Girls for admissions into 1st year intermediate MPC (with IITJEE / EAMCET coaching) and BPC (with EAMCET Coaching) and MEC/CEC (with CA-CPT Coaching) with English as the medium of instruction for the academic year 2017-18. The notification for Telangana Society TSWREIS Intermediate Coaching admissions notification 2017 has been announced. (a) The students should have passed SSC in one attempt in March, 2017 in Telangana State. (b) The students should apply within his / her own Region. (c) Students who studied in Telugu Medium in 10th Class can also apply in English Medium Colleges. (d) A copy of the marks memo of SSC obtained through E-SEVA / MEE-SEVA is to be submitted at the time of counseling. (e) The annual income of the parent shall not exceed Rs.2,00,000/- per annum. The income certificate to this effect should be issued by the Tahasildar. (f) The age of the students shall not exceed 17 years as on 31.08.2017 and in case of all SC students will be given 1 year relaxation. [BC, ST, OC, Minority students has to born 01.09.2000 to 31.08.2001 & SC- 01.09.1999 to 31.08.2001]. (g) The students should produce Caste and Income certificates issued by the Tahasildar. (h) All the original certificates should submit at the Counseling Centre during counseling time without fail. 1. Out of 75 % Scheduled caste seats, 60% of seats are reserved for the students who have studied in TSWR Institutions and SW Hostels, remaining 40% of seats are allotted for other SC students those who studied in any other recognized institutions. 2. The BC, ST, Minority, Others (OC) and BC-C (Converted Christian) seats are filled as per the SSC merit. If due to any reason, the seats are not filled in the said category, the seats will be filled with the SC students of TSWREI Society and SW Hostels as per the merit. 3. 3% of overall seats will be reserved for the Physically Handicapped / Differently abled children who can attend their work without anybody’s help, based on the certificate issued by the Medical Board. 5. Up to 3% of overall seats are to be earmarked for orphans / destitute in the age appropriate class in Residential Schools / Residential Jr. Colleges run by welfare departments and Education department as per G.O.Ms.No.47, Dated 31.08.2010 of women & Child welfare Department. Last date to receive filled in applications through on-line is 31.05.2017. The candidates who applied for Intermediate admissions should attend the counseling on 07.06.2017 by 9:30 a.m. without fail at the counseling centers of their region. Boys should attend at Boys Center and Girls should be attend at Girls centers displayed for their region. The TSWREI Society, Hyderabad will not collect any amount for On-line application (free of cost). Note: 1. The Counseling process will start at 10:30 A.M. on 07.06.2017 and continue till last evening until the entire process is completed. All the candidates who have applied for admission into TSWR Institutions must personally attend counseling with the necessary original certificates. 2. Classes will be commences from 12.06.2017. Tags: telangana tswreis society admission into intermediate mpc bpc mec telangana society tswreis intermediate coaching 2017, telangana social welfare residential educational institutions society: hyderabad admission into intermediate 1st year mpc, bpc, mec, cec & hec groups for the academic year 2017-2018, tswreis inter admissions 2017 notification, exam dates, online application form for tswreis inter 1st year admissions 2017. tswr inter admissions important dates, telangana social welfare inter admissions 2017 eligibility,download application form, selection process, results,selection list @ tswreis.telangana.gov.in selection list/ results(ts social welfare) 2017.